Author groups on Facebook can be wonderful things - when they're not distracting you from getting on with some writing! Yesterday, a call went out from a member of the Writers Unite! group for authors to list ten books that had stayed with them over the years. The idea is not to overthink it - just list the ten books that first come into your head. Here's my ten that popped into my head, and I suspect I'll get fellow author Ricardo Victoria to add his list either below or in a separate post. What about yours? Do share in the comments! As a youngster, I won a writing competition. Just a little one in school, but the prize was a book voucher and this was the book I made a beeline to go and purchase. It is the story of a Polish family of four children during the Second World War - and their struggle to keep together, and to search for their parents across the war-torn continent. The Silver Sword of the title is one of the only family keepsakes they still have, a letter opener shaped like a sword. It is a harrowing story at times, but an astonishing one - and all the more astonishing for being a children's story in a landscape of terrible war. When I moved continents a few years back, I had room for only two books in my bag to bring with me. This was one of them. 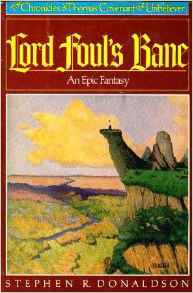 At a time when I was reading fantasy fiction that it would be fair to say was treading a traditional path, discovering the Earthsea trilogy - as it was then - and particularly its opener A Wizard of Earthsea, was a revelation. Le Guin is a genius, and this is a book that expands horizons, that dares to be individual in a crowd of familiar fantasy faces, and which brings a keen awareness of one thing that seldom applies in the genre: consequences. Our hero, Ged, the Sparrowhawk, is busily learning the art of magic, only to discover that it has a price that he did not realise he would have to pay. Characters are fresh and danger feels real, and all too often self-inflicted. 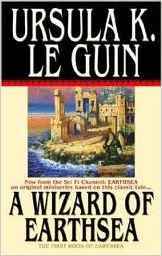 There is power in words in this world, and there is a real power in Le Guin's words as she forges one of the finest fantasy novels ever written. Poking around the second-hand book stall in the Grainger Market in Newcastle was always one of my favourite things to do on day trips growing up. And as a teenager one day I hit the mother lode, finding hardback editions of the Chronicles of Thomas Covenant. If you've never read the series, be warned: you'll hate the lead character. After all these years, I still don't think I've found a lead character who I've hated more. Thomas Covenant. Unbeliever. Leper. Implausibly, hero. 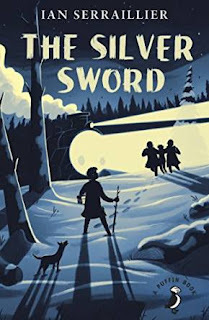 Imagine an adult, cruel Narnia - a world into which our hero falls after a car accident, ripped apart by warring factions and which needs Covenant to bring redemption. Except he doesn't believe in the world, doesn't believe in reality, and treats the people he encounters like creatures from a dream, dealing with them abominably until he finds himself forced to face up to the possibility that it all does matter, that it is truly up to him. I'll hate Covenant till my dying day, but this book, the whole series is magnificent. The book I have read most often over the years is, without a doubt, The Lord of the Rings. I first read it when I was about eight years old, and my tattered, battered childhood copy was the one that came out at the time of the Ralph Bakshi animated version of the tale. Since then, I've read it dozens of times, listened to the audiotales and, of course, seen the movies - though I'll confess to respecting the films, but not loving them. I mentioned earlier that when I upped sticks and moved halfway around the world that only two books made the journey with me. This was the second book. No one has ever confounded me quite so much as Ray Bradbury. He takes simple ingredients - words, sentences, a dash of plot, a stirring of character - and creates magic. This is the story of a circus that comes to town, a dark carnival, that promises your heart's desire - at the simple cost of your soul. 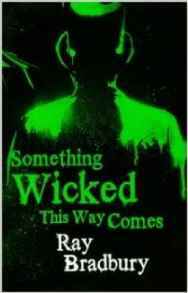 It's a Faustian funfair, a devilish delight, but what this book is most of all is a story of a father and his son, a man growing old not wanting to see his son outgrow needing his father; a son growing up not wanting to lose the magic of family. It's a coming of age story seen from both sides, and it's exquisitely beautiful. It's not my absolute favourite piece of writing by Bradbury - that honour goes to Green Shadows, White Whale, which can move me to tears with the beauty of its craft - but this, this book, is his work that is most personal to me, and which I'll treasure forever. 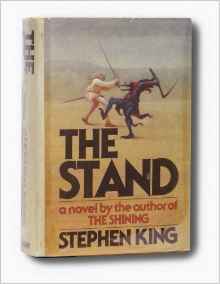 If you've never tried The Stand, you really owe it to yourself to do so. It's a post-apocalyptic tale par excellence. This is the way the world ends - not with a bang, but with an error in the Department of Defense. 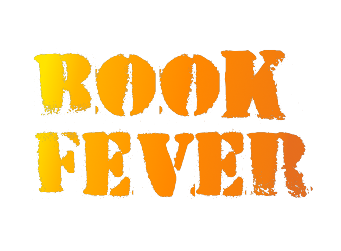 With a virus that sweeps the world, leaving a hotch-potch of survivors. So far, so standard you might think, yes? We've seen this before, right? Heck, I can tune into The Walking Dead for that every week! Except you can't. Because this is just the start. King weaves a tapestry showing the world that becomes, and the mythic war that is to follow as quite the craziest damn villain ever to rear his head strides the new world like a demon demanding his tribute. It becomes a holy war, a fight for survival and a fight for hearts and souls. King's characterisation is perfect - I've rarely been so distraught by what happens to characters I've come to love - and while the book is huge, even more so if you get the expanded cut of recent years, it never feels that way. It's been turned into a mini-series before (a pretty good one, too) but it feels way, way bigger than most worlds that writers would dare to conjure. 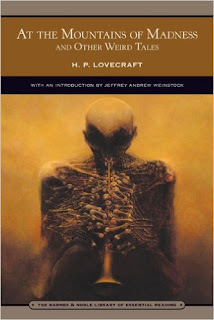 Let me be clear on one thing: HP Lovecraft is not a great writer. However, he is a Great Writer. What do I mean? Well, if you start trying to read his work, you'll find his writing awkward, full of humdinger words that show he swallowed a dictionary, sentence structure that positively repels the reader, and repeatedly familiar formats in how his doomed heroes set about their investiations. But what dreams the man can conjure. The collected works in his Cthulhu Mythos are astonishing. He invented a remarkably coherent universe of Elder Gods and monsters from both our real world and the Dreamlands in which we sometimes wander. His grab-bag collections of short stories are bursting at the seams with fantastic ideas, some of which are fully realised in his work, some of which you feel tantalisingly slip through his fingers. At The Mountains of Madness has long been my favourite work of his, set in an Antarctic landscape that adds to the ever-present chill down one's spine when reading his work, and leading to one of the most remarkable conclusions in Lovecraft's work, a denouement that questions man's place in the universe, and sets him small in a landscape far greater than he should dare venture into. 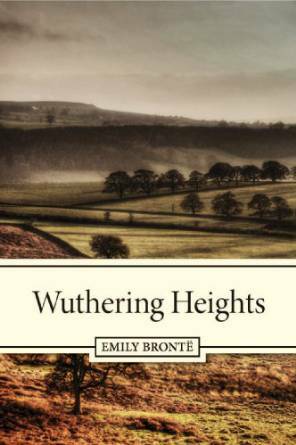 I've never quite fathomed how Wuthering Heights is regarded as one of the great love stories. Heathcliff is a beast. Catherine is abused and broken. The world is dour, bleak and miserable. And it's all throughly magnificent. The manifestation of the moorland roughness around it, this is a book full of rough passion, wrong decisions and both the brutality of nature and the nature of brutality. There is nothing gentle here, but like the moors around them, the characters and their emotions endure, and are made of stronger stuff than the flighty characters from other parts of the world. 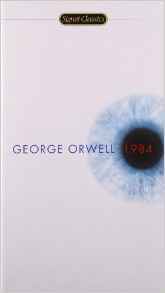 It takes something remarkable for a novel to burst beyond the limits of its covers to become as widely acknowledged as 1984. We speak of Orwellian intervention by government - and yet many who use the term may never have cracked the covers of this book. We fear being watched by Big Brother - even as we gleefully watch a show of the same name with its ever-seeing eye watching over contestants in a house, with many never having a clue of the origin of the term used. We talk about Newspeak, and note how people change words as if that somehow does away with their meaning. Management talks of issues, not problems. Our vocabulary of dissent is eroded, taken away, and the destination we travel to in following this path is 1984. Not just a novel, but a firebrand that should be burned into the mind of every dream of revolution. Most tales of the apocalypse are big affairs. 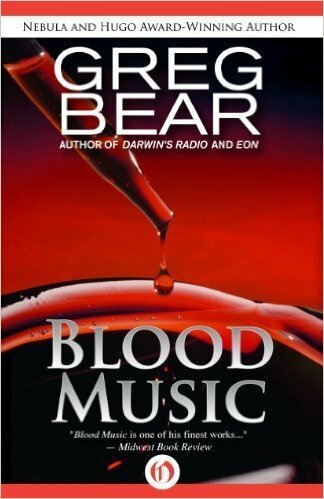 Greg Bear's is a small apocalypse. A very small one. On the bacterial level. As germs become smart. As germs organise. As germs assimilate and America becomes... one of the most extraordinary visions in modern literature. Sadness permeates this novel as you watch the world unravel, as you watch characters you come to love face the inevitable. There are many writers who write of brave new worlds, but few who have conjured such a strange new world. 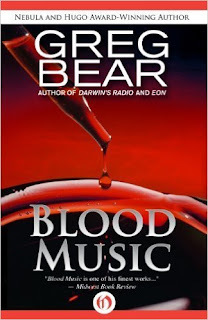 Bear takes his storyline to the furthest extreme and dares to follow it through to its darkest conclusion. 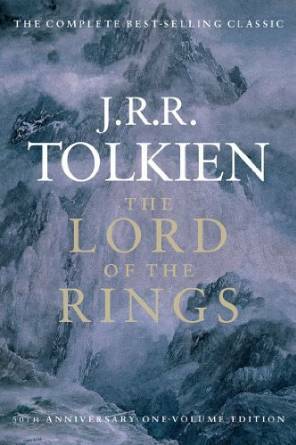 So there we go, ten books that have lingered in my brain over the years - what's yours? Don't be shy, the comments await!